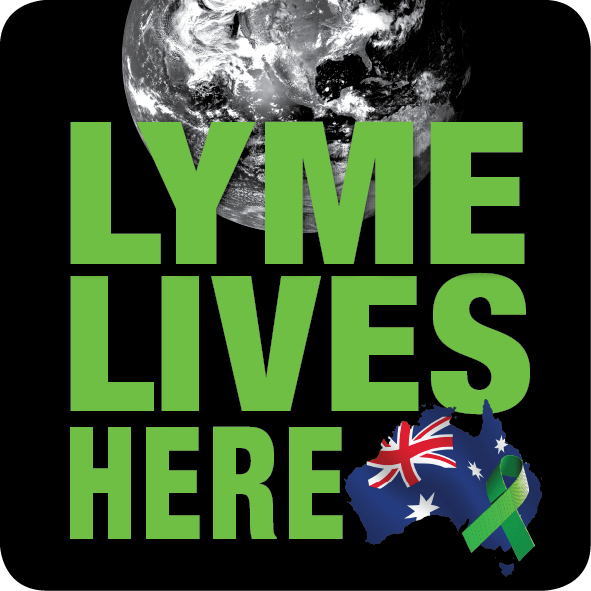 For the Inaugural (2013) WWLP Protest, a 'Lyme Lives Here' ﻿ facebook "avatar" concept was conceptualised by Worldwide Lyme Protest - Australia Team members Tom Goddard and Sharon Whiteman and designed by Sim Hadad (who also designed the Australian posters for the 2013 campaign). Karen Smith, Australia's International representative, asked other country representatives to encourage worldwide participation in the campaign. As the original avatar came out with the Australian map, Sim provided Karen and Lisa Hilton (US International rep) with the "basic" avatar (pictured opposite) which they then altered (the flags/map symbols) for the countries that wished to participate and share the avatar on Facebook/ use in their profile pictures. See opposite for the "blank" Lyme Live Lives Here image, which is the picture that can be downloaded on the file directly below. 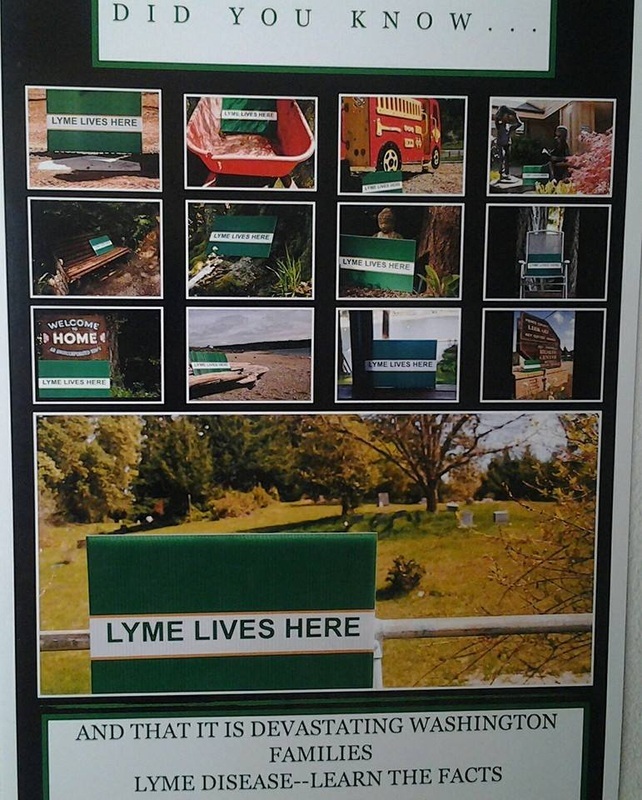 "Lyme lives here in WA State! 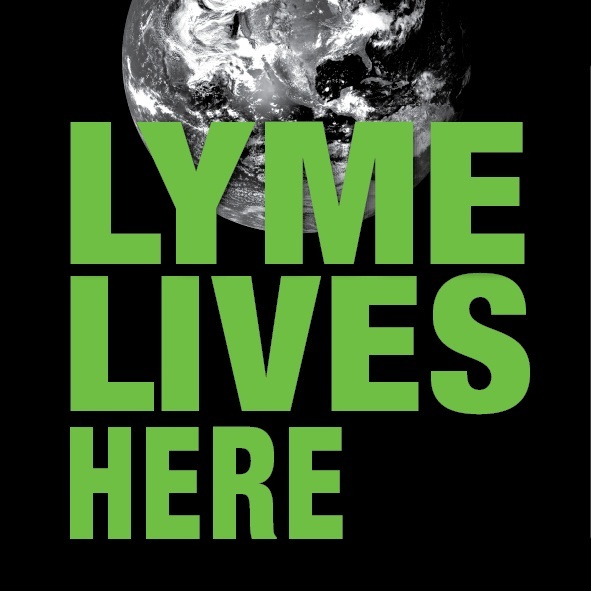 we take this poster to our Lyme awareness events"
In preparations for the 2014 Worldwide Lyme Protest campaign, Lisa Hilton spoke to Lorraine and Anna Hart (Washington State, US Coordinators). 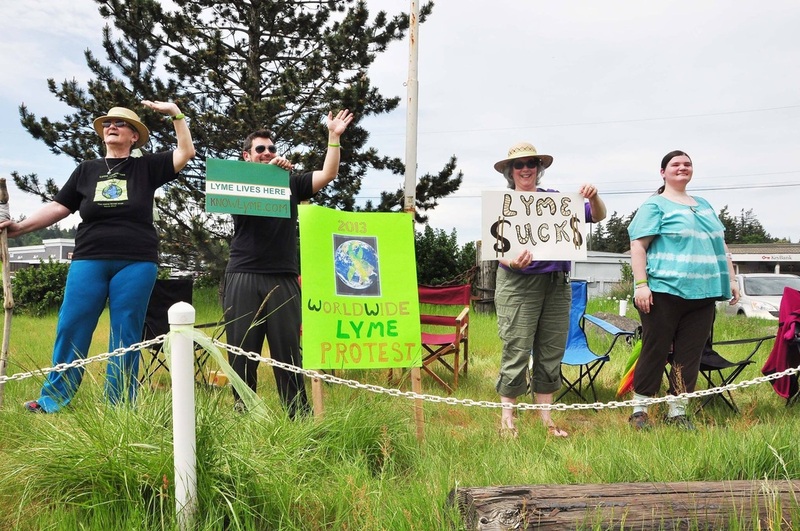 As noted by Lisa: "When talking to Lorraine and Anna regarding awareness, they mentioned that for the last few years that they had been standing outside with a sign that read, "Lyme Lives Here." When people would inquire about what they were doing, they would hand them Lyme awareness brochures. Photo opposite is a collection of their Lyme Lives Here pictures from various years/awareness events, and the photo below is from their Worldwide awareness event in May 2013. In 2014, when planning ideas that would give people a way to participate in the International awareness campaigns, Lisa thought that by combining the above two initiatives into one big campaign, it would not only give people a way to participate on facebook, but also at home and at awareness events around the country. It would also provide another way to unify patients around the globe for Lyme awareness. On an intersection or at a park. Of course, please don't block or obstruct traffic or thru traffic. Hold up a sign at the mall, school, hospital grounds, or any public place. Check ahead to see if you need permission. See the Global Lyme & Invisible Illness Organisation Website for a collection of Lyme Lives Here photos from around the world.